IRIM is accepting applications for the 2019 program. The deadline is January 31, 2019. Georgia Tech’s Institute for Robotics and Intelligent Machines (IRIM) serves as an umbrella under which robotics researchers, educators, and students from across campus can come together to advance the many high-powered and diverse robotics activities at Georgia Tech. 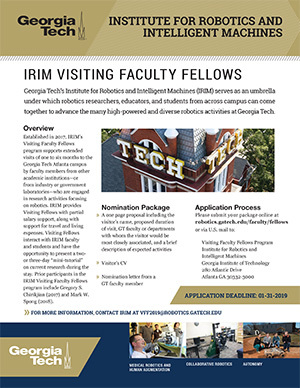 Established in 2017, IRIM’s Visiting Faculty Fellows program supports extended visits of one to six months to the Georgia Tech Atlanta campus by faculty members from other academic institutions—or from industry or government laboratories—who are engaged in research activities focusing on robotics. IRIM provides Visiting Fellows with partial salary support, along with support for travel and living expenses. Visiting Fellows interact with IRIM faculty and students and have the opportunity to present a two-or three-day “mini-tutorial” on current research during the stay. Prior participants in the IRIM Visiting Faculty Fellows program include Gregory S. Chirikjian (2017) and Mark W. Spong (2018). For more information, contact IRIM at VFF2019@robotics.gatech.edu.